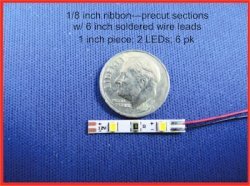 Custom designed especially for illuminating the interiors of dollhouses, roomboxes and other miniatures: This ribbon is literally the worlds smallest LED strip. 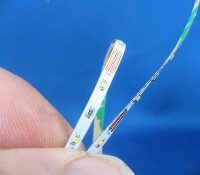 It is so small that I refer to it as a ribbon on LEDs. 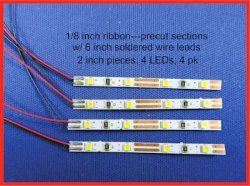 A full strip is 21 inches long and only 1/8th inch wide with 42 LEDs. 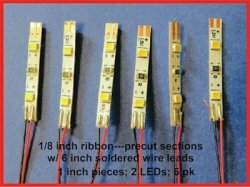 The strip can be cut at every two LEDs and by soldering another set of wire leads to the cut-off; both pieces can be used. The strip has double stick tape on the back to make for easy installation. 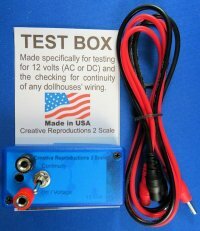 The strip works on 12 volts DC only. 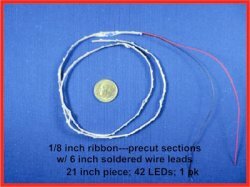 This ribbon is sold in several different pre-wired cut lengths and is available in both warm white and pure white colors. Because of its small size it is easily hidden behind small moldings and makes a perfect light to illuminate room boxes, each room of a dollhouse, or the interior of kitchen cabinets.